Mustafa Abu Yazid on As Sahab, al Qaeda’s propaganda arm. Unconfirmed reports from Pakistan indicate that Mustafa Abu Yazid, al Qaeda’s commander in Afghanistan, has been killed during the heavy fighting in Pakistan’s tribal agency of Bajaur. The report of Yazid’s death is based on statements made by an unnamed senior Pakistani security official. Pakistani television claimed Abu Saeed al Masri was killed in fighting in Bajaur. Yazid is also known as Sheikh Saeed and Abu Saeed al Masri (the Egyptian). But it is unclear if this Abu Saeed al Masri is the same person as Yazid. 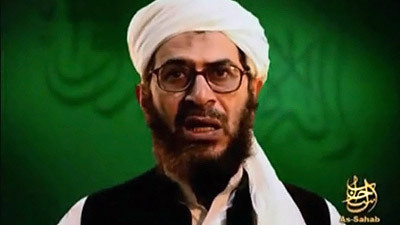 Other al Qaeda operatives go by the name of Sheikh Saeed, a senior US military intelligence official warned The Long War Journal. Yazid serves as al Qaeda’s senior military commander in Afghanistan as well as a senior spokesman. He was born on Dec. 17, 1955 in Egypt, according to Geo TV, who recently interviewed Yazid. The 9-11 Commission identified Yazid as al Qaeda’s “chief financial manager.” Yazid “served time in jail with al Qaeda deputy leader Ayman al Zawahiri after the assassination of Egyptian President Anwar Sadat in 1981,” Reuters reported. The Bajaur tribal agency is al Qaeda’s command and control hub for operations across the border in northeastern Afghanistan. Fighting in Bajaur has been heavy over the past week after the government attempted to reassert control over the Taliban and al Qaeda safe haven. Last week, a large Taliban force surrounded and ambushed a 200-man convoy of Frontier Corps forces moving into the region. Heavy fighting broke out after the Frontier Corps troops attempted to break the encirclement. Scores of Pakistani soldiers have been reported killed or captured, and more than a hundred Taliban have been reported killed as well. Pakistani forces retreated from the region and the Taliban are digging in around Khar, the administrative seat for Bajaur. There has been no independent confirmation of Yazid’s death. Al Qaeda has yet to release a notice of Yazid’s death. In the past, al Qaeda has quickly notified their followers of the death of senior leaders. Abu Laith al Libi’s death was announced within 36 hours of the US airstrike, while Abu Khabab al Masri’s death was announced within four days of the attack. Al Libi was a senior al Qaeda leader in Afghanistan, while Khabab was al Qaeda’s senior explosive and weapons of mass destruction expert. Senior US military and intelligence officials contacted by The Long War Journal said the claims of Yazid’s death are being investigated but cannot be confirmed at this moment. Reports of the deaths of senior al Qaeda leaders from unnamed Pakistani sources are spotty at best. Last week, STRATFOR and CBS News reported that Ayman al Zawahiri was killed or seriously wounded during the July 28 airstrike on an al Qaeda safe house in South Waziristan. The Taliban denied the claims, and US intelligence officials were suspicious. The reports of Zawahiri’s death were proven false after Zawahiri appeared on a videotape this week, speaking in English and calling for the overthrow of President Musharraf and the Pakistani government. If Yazid’s death is confirmed, he would be the fourth senior al Qaeda leader killed in Pakistan’s tribal areas this year. The US military killed Khabab during a targeted strike on an al Qaeda safe house in a village in South Waziristan on July 28. Three members of Khabab’s staff were also killed in the attack. On May 14, Abu Sulayman Jazairi, a senior Algerian operative for al Qaeda’s central organization who directed the groups external operations, was killed in an airstrike against a Taliban and al Qaeda safe house in the town of Damadola in Pakistan’s Bajaur tribal agency along with 13 associates. Jazairi is described as a senior trainer, an explosives expert, and an operational commander tasked with planning attacks on the West. Abu Laith al Libi was killed in a US strike inside the North Waziristan tribal agency in Pakistan in late January. Al Libi was the leader of the Libyan Islamic Fighting Group and served as a chief spokesman for al Qaeda. Laith also commanded al Qaeda forces in Afghanistan. The US has also struck at Taliban and al Qaeda safe house inside Pakistan at least two other times this year. On March 16, US forces struck at the fortified compound owned by Noorullah Wazir, a Pakistani tribal elder who lived in the village of Dhook Pir Bagh some five kilometers from Wana, the headquarters of South Waziristan. Another nearby house, where Uzbek and Arab fighters had recently stayed, was also destroyed in a separate round of missile fire. On March 12, the US military fired guided missiles from Afghanistan into a compound run by Siraj Haqqani, the wanted Taliban leader behind numerous attacks in Afghanistan. The attack is believed to have killed three senior Haqqani network commanders and “many” Chechen fighters. Last year, the US struck at an al Qaeda safehouse inside Pakistan on Dec. 28, the day after Benazir Bhutto’s assassination. The US military targeted the home of Sheikh Essa, an Egyptian cleric responsible for pushing the Taliban to overthrow the Pakistani government. Essa was said to have been wounded in the attack. In August 2007, Pakistani forces hit two Taliban and al Qaeda bases in the village of Daygan, North Waziristan. Camps and bases in Damadola, Danda Saidgai, Chingai, Zamazola, again in Danda Saidgai, and Mami Rogha were hit over the course of 2006 and 2007. These strikes have done little to disrupt the growth of al Qaeda and the Taliban in northwestern Pakistan. The Taliban and al Qaeda maintain more than 100 terror camps in the Northwest Frontier Province and the tribal areas, and are consolidating their control over the tribal areas and several settled districts in the Northwest Frontier Province. One of Al Qaeda’s top terrorists, Abu Saeed al-Masri, was reportedly killed in Pakistan recently. He was an evil human being and the world is certainly a safer place today because of his death. While I would be pleased to hear that we are eliminating the leadership of Afghan insurgents, this strikes a troubling parallel with the killing of Zarqawi in June ’06. Things in Afghanistan are getting worse, and the best news we hear out of Afghanistan are reports of dead terrorists, rather than systematic action. This was the case in Iraq during 2006 until Gen. Petraeus’s counterinsurgency plan was implemented. I know that Secretary Gates recently announced a plan to expand the size of the ANA, and that the challenges we face in Afghanistan require different solutions than those in Iraq, but I don’t have much confidence that things will get better until we see some comprehensive strategy for how we will win. The Kagans and Gen. Keane outlined the general plan for the surge in late 2006, which was later implemented. Here are my questions- what is our current strategy, and do any of you know if there any solid, cogent proposals by experts on the conflict that have a chance of being implemented and are available to the public? Killing terrorists is great but until we have the ability to cross borders, it’s all hearsay. We could control what happens in Afghanistan if we could control what comes into and out of Pakistan. I had asked last week if we had anything along the lines of an enemy Order of Battle. Knowledgable people responded, and the LWJ is the best news source out there to inform us, but our forces are handicapped if we don’t know where our enemy is. You can’t kill and ultimately defeat your enemy if you do not know where they are. Thus, the mainstream news reports of individual, even if important, kills are of limited significance. In addition, AQ et. al. are worthy adversaries, they replace leaders and are a resilient organization. Dismantling an organization by eliminating a leader or two, as if the insurgents are simply a Mafia-like law enforcement problem, does not work. We need to unleash our dogs of war. Is there a Petraeus-like counter-insurgency plan for Afghanistan? Gates is pushing for a massive expansion of the Afghan military, a plan promoted earlier by a retired general whose name escapes me at the moment. It sounds promising, because really, the current 60,000-some Afghan troops aren’t enough for an entire country–especially at their current level of equipment. We’re talking about AK-47s and pickup trucks. Right now, they measure their forces by brigades, not divisions. They will need a lot more vehicles, including armor, and a lot more cargo planes and attack helicopters. We’re also going to need a microfinance surge to jump-start the Afghan economy and give fence-sitters an alternative to opium production. Alex is right — the answer is a surge for us, but also a surge in Afghan strength. The best way to cut an Islamist inurgency stirred up among starry-eyed youths in tribal Pakistan is to ensure that they are most likely to face Muslim troops if they attack in Afghanistan. I agree with the comments, especially the need for an overall strategy. The biggest obstacle is what to do with Pakistan. Afghanistan was doing relatively well, until the peace accords between the Taliban and the Pakistani government began in 2006. For it to be strategically effective, targeting top leadership needs to be conjunction with a comprehensive plan. Targeting the leadership alone has little significance. That is what happened in Iraq, when General Petraeus arrived as Jonathan noted. One of the effects of the counterinsurgency plan was the dismantling of the AQI leadership relatively quickly (thanks Task Force 88). As a result, AQI didn’t have the resources, time, training or support to keep replenishing the pool of leadership candidates. For AQ Central, they do have the means to replenish their leadership ranks, thanks primarily to the training camps currently operating in Pakistan. On another note, media reports refer to al-Yazid as the third most senior figure, after the five earlier occupants have been killed or captured. Below is the succession. If the reports are true of his death and I remain skeptical, the #3 position is very hazardous. Yazid is nt al Qaeda’s number three, that is widely believed to be Saif al Adel, who is sheltering in Iran. I definitely agree that killing al Qaeda leaders is not effective without an overall COIN strategy in place in both Afghanistan and Pakistan. Without Pakistan being addressed, Afghanistan will remain a stalemate. But there are benefits to hitting these leaders. It disrupts their operations, forces junior leader to take on more responsibility, and exposes intelligence on al Qaeda’s senior leadership. Given that though, there is a maximum rate at which you can grow an army. Its is limited by how fast you can train officers, senior NCOs and technical experts. No matter how many trainers you have, it still takes years. So any way you slice it, it will be several years (3? 5? 7?) before ANSF will be able secure the country. If Saif al Adel is in Iran, what is keeping #1 OBL from being in Iran? Saif al Adel, that’s someone I haven’t heard about in a while. Fell off my radar there for a moment. I agree with your comments about hitting the leadership. There are definitely short-term tactical benefits. In the long haul, less effective on the overall strategic situation, unless accompanied by a COIN strategy. Ah, but all the smart debonair people say that Iran wouldn’t harbor al-Qaeda because al-Qaeda is Sunni and Iran is predominantly Shi’ite. Could they be wrong…who would have thought! Maybe radical Islamists can find a lot of common ground when it comes to killing Americans? Though it helps USA, it doesnot help the long term goals as fresh recruits are trained and sent back from more than 100 odd training centres run by ISI which has privatised it to LET>The funding from Saudi arabia is the Key and it has to be stopped. Realy great news if confirmed but there are rumers in local FATA circles that Abu Yazid was killed in Kurram not in Bajaur. There is heavy fighting going on in Kurram between Talibans and local anti taliban Turi tribe in Kurram. The militants of Turi tribe smashed so many centers of terrorists in lower kurram.As so many talibans from waziristan and other AQ fugitives are involved and the presence of Abu Yazid along with his group was confirmed in the area few weeks ago. it’s just the rumour, right? ?